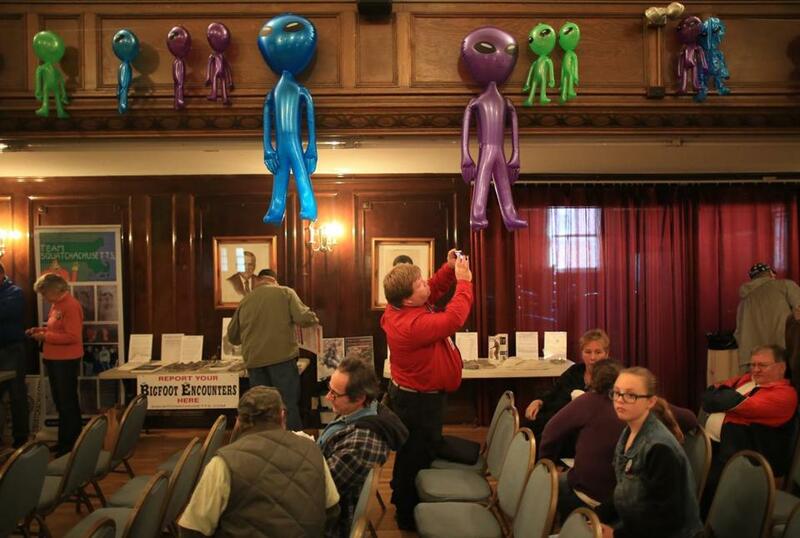 The 2015 Greater New England UFO Conference in Leominster. They showed off high-definition camera arrays they had developed to detect alien spacecraft. They mulled over an academic study of people who have made contact with extraterrestrials. They made the connection between flying saucers, Bigfoot-type creatures, and ghosts. 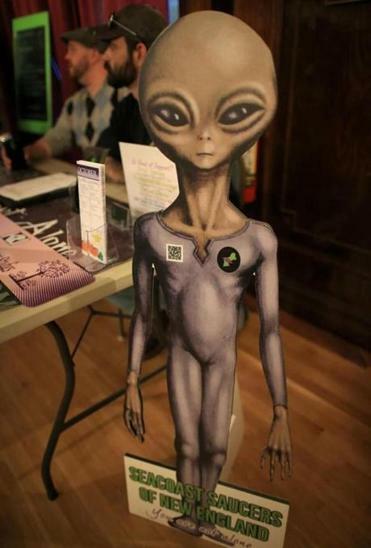 They were the true believers who filed into Leominster City Hall Saturday — festooned with inflatable aliens, casts of Sasquatch footprints, and tables full of souvenir T-shirts — to attend the Greater New England UFO Conference. And many of them were glad to find each other. The conference is serious business to researchers like Hall, as well as representatives of a network of UFO investigators called MUFON, who presented the alien detection camera arrays, and the Foundation for Research into Extraterrestrial Encounters, which is conducting the study of folks who’ve had close encounters. For others, the convention was just an excuse to have a good time. “I want people to be happy,” said Susan McNeill Spuhler, one of the event’s co-organizers, a sales executive who paid nearly $10,000 to advertise the event, fly in speakers, and put them up in hotels. Despite never having seen an alien herself, Spuhler also created a model UFO that she mounted in her truck for a recent parade celebrating Leominster’s 100th anniversary as a city, while water and dry ice emitted a foggy stream from her truck bed. Another organizer, Willy Miranda, said about 350 people turned out this year, well above the 60 to 70 who came last year when tickets were $60 instead of $25. Spuhler, dressed in a pantsuit and wearing a Bluetooth earpiece, said she expected to break even, and the workers at a food truck outside reported doing brisk business. Why was Leominster chosen for this event? Ronny LeBlanc, 41, who is co-writing a book about a section of Leominster he dubbed “Monsterland,” said residents frequently report odd sightings of UFOs and Bigfoot creatures, which often seemed to disappear suddenly, as if into another dimension. One of the displays at the conference. Some of the attendees took the subject matter as seriously as the speakers. The crowd skewed older. There were no children present Saturday, and a planned costume contest drew just two entrants. Carlisle resident Jonathan Barrett, 31, said he had “obsessively” researched mysterious aircraft and military programs since he was 16. Others mixed and matched their beliefs. Some audience members chuckled when Hall played an infrared video of what he said could have been an otherworldly being, but that looked like a squirrel near a tree. For the record, Hall said it was not a squirrel and said a video and photography expert working for MUFON had agreed. But some of those same snickering audience members later raised their hands when another speaker asked if they had a close encounter of the third kind. Ellen Essex, who came from Apex, N.C., to attend, said she saw a UFO in 1989, and also believed the Sept. 11 attacks were orchestrated by the US government. But she rejected other stories, including most Bigfoot sightings and theories she has heard about President Obama being a reptilian alien. “Unless I see proof for myself, I don’t know,” she said. It’s like that at a UFO convention. People are drawn to the possibility that there’s something out there, but no one wants look like one of the crazy ones. That was the general consensus: It’s just a matter of gathering proof and alerting the public — and then, perhaps, making contact. 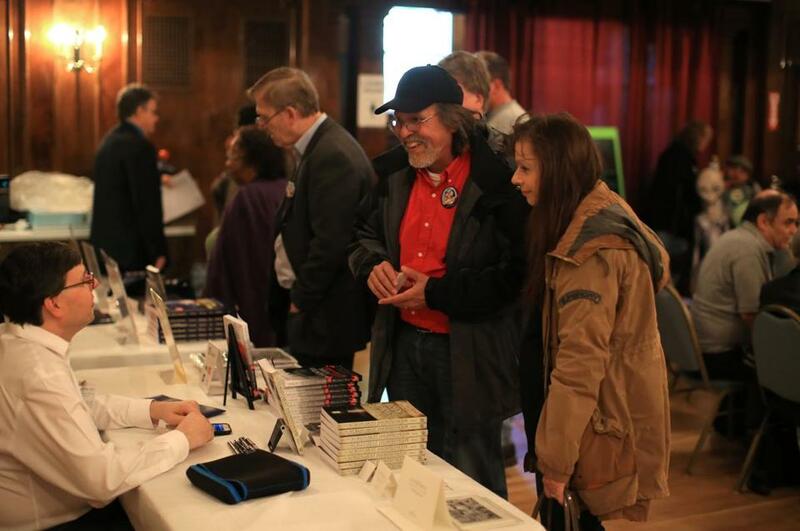 Oscar De Los Santos, middle, with Kelly Goodridge, right, at the 2015 Greater New England UFO Conference.